29 Nov 2018 --- Kellogg UK is to adopt color-coded labeling in the UK on cereal packs made exclusively for sale in Britain. 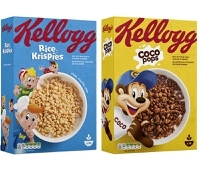 The new labeling is to start from January 2019 on brands including Coco Pops, Crunchy Nut, Corn Flakes, Rice Krispies, Frosties and Special K. The news comes a day after PepsiCo announced it will trial interpretative color-coded labeling for both beverages and foods in many EU markets, using the 100g/ml-based approach already voluntarily implemented in the UK and Ireland. The traffic light labeling scheme was introduced in the UK in 2013. The scheme labels products with green, amber or red, seeking to help consumers identify products that have low, medium or high levels of salt, fat and sugar. “Following our announcement late last year to overhaul our cereal in the UK, we are now following that up with a new and modern Kellogg pack redesign in 2019,” says Kellogg UK Managing Director Oli Morton. Kellogg UK’s decision to change its front of pack labels comes on the back of substantial work by the business to overhaul its breakfast cereals. This includes reducing sugar by 40 percent in Coco Pops cereal and 20 percent sugar reduction in Rice Krispies cereal, the removal of artificial colors and the launch of no added sugar and vegan-friendly foods. Almost 80 percent of Kellogg’s cereals on sale in the UK and Ireland will have color labeling on the boxes. The company has decided not to include the new design on multilingual boxes, shared across a number of European countries, because color-coded labels are not well-known in these areas. However, Pepsico’s decision to trial interpretative color-coded labeling for both beverages and foods in many EU markets could change this. PepsiCo was one of the companies behind the Evolved Nutrition Label (ENL) scheme, based on the existing Reference Intake scheme, familiar to 500 million EU consumers, which reflected the nutrient content per actual portion consumed. After two years of working together on a project aimed at creating traffic light nutrition labels to help EU consumers better understand what is in their food, the five major companies involved – Coca-Cola, Mondelez, Nestlé, PepsiCo and Unilever – last week abandoned trials. The companies had collaborated on the ENL since March 2017, in a bid to develop a color-coded nutrition label on their products’ packages in the EU, but decided to shelve the work. Ultimately, the ENL companies acknowledged that the lack of EU-defined portion sizes had led to insufficient understanding and support of the scheme and, in the absence of legally defined portion sizes, announced their decision to suspend ENL trials on 20 November.